Kantar-GeoPoll Media Measurement collects daily data on TV ratings*, share**, and audience size in Kenya. This unprecedented, real-time information allows media owners and agencies to make more effective decisions on ad buys and programming. This report includes data on the top TV stations in Kenya from July to September. To subscribe to our full product, which includes overnight ratings that can be filtered by demographics, location, and more, register for a GeoPoll account or contact us for more information. From July 1st to September 30th, 2015 GeoPoll found that Citizen maintains the highest ratings overall during the evening prime time, seeing their highest viewership at 19:00 and 21:00 when Swahili and English news shows are airing. During both of these time periods, Citizen has a rating of over 10.0. KTN comes second in terms of ratings, with ratings peaks of 3.2 at 20:30 and 3.8 at 21:30. GeoPoll also examined the top stations in Kenya by average share, finding that Citizen, KTN, and NTV come in first, second, and third respectively. They are followed by K24 and QTV. 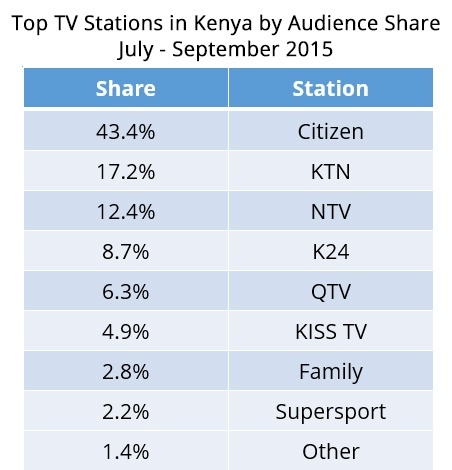 Together, the top 5 stations command approximately 88% of the audience share in Kenya. GeoPoll’s data also includes findings on male versus female viewership. From July – September, we find that Citizen has a higher share among female viewers, 57%, compared to male viewers, 47%. NTV has a higher share with male viewers: it commands an average share of 17.5% of male viewers, and 13.0% of female viewers. KGMM is available on a subscription basis in Kenya with special rates for broadcasters. Click below to contact us for more information and a GeoPoll representative will be in touch shortly.